Take calls and listen to music while wirelessly connected to your computer, Bluetooth-enabled desk phone, mobile phone, or tablet with the Voyager Focus UC Bluetooth Headset from Plantronics. With up to 12 hours of talk time and a roaming range up to 98', the Voyager Focus boasts a DSP (digital sound processing)-enabled triple-mic boom and active noise cancellation, allowing you to concentrate on your calls and music. The Voyager Focus headset features voice alerts that announce caller ID, connection status, and talk time, while a dynamic mute alert warns you if you try to talk while the headset is muted. With built-in smart sensors, the headset can detect when you take it off and automatically mute your call or pause your music. Optimized for use with Microsoft unified communications apps, this version of the Voyager Focus includes a magnetic charging stand and a USB Type-A Bluetooth adapter with a mute status indicator. The Voyager Focus headset boasts SoundGuard Digital technology that helps protect against sound levels above 118 dBA, while an anti-startle feature is designed to detect and eliminate any sudden increase in signal level during calls. Time-Weighted Average prevents average daily noise exposure from exceeding 85 dBA. Additional lower level hearing protection against acoustic startle is provided by the downloadable Plantronics Hub software, limiting peak levels to 102 dBA. The acoustic protection monitors and controls all audio sources from mobile and PC in telecom modes. Works seamlessly across your PC, mobile phone, tablet, Bluetooth-enabled desk phone, and smartwatch. Wear the headset any way you like and the controls will be where you expect them. The controls for pause/play, track forward/back, and volume adjust to how the headset is oriented. Precision tuned triple-mics with enhanced DSP allow for background noise cancellation, while on-demand active noise cancellation lets you focus on your call or work. Control your conversations with intuitive mute capabilities and built-in smart sensors. Easily mute/unmute with the touch of a button, or simply by taking the headset off and putting it back on. Music pauses automatically when a call comes in. Know whether you're on mute by glancing at the screen (while using the Plantronics Hub software) or checking the USB adapter. If you try to talk while your mic is muted, the Dynamic Mute Alert will give you an audible reminder. Stereo design with A2DP provides hi-fi stereo sound (20 Hz - 20 kHz) and an immersive audio experience. The headset also offers wideband audio performance up to 6800 Hz. The Voyager Focus features leatherette ear cushions wrapped around soft memory foam, while the cushioned metal headband provides durability while maintaining a comfortable, secure fit. Folding ear cushions and the included carrying case let you take the headset on the go. The online indicator lights on the ear pads let others know when you are on a call. The OpenMic button allows you to hear your surroundings when you need to without having to take the headset off. Roam up to 98', and the headset will switch between Class 1 and Class 2 Bluetooth based on its proximity to the Bluetooth mini-USB adapter in order to preserve battery life. Up to 12 hours of talk time (or up to 10 hours with active noise cancellation enabled). Up to 15 hours of listening time (or up to 12 hours with active noise cancellation enabled). Controls found on the Voyager Focus include call answer/ignore/end/redial, mute, volume up or down, Bluetooth pairing, active noise-cancelling modes, OpenMic, smartphone VPA (virtual personal assistant) access, and power on/off. Choose the settings to customize your headset with Plantronics Hub app for iPhone, Android, Windows, and Mac. Check remaining talk time and select your language preference, feature settings, and call and mute notifications. Keep your device up to date with Plantronics Hub over-the-air firmware updates. 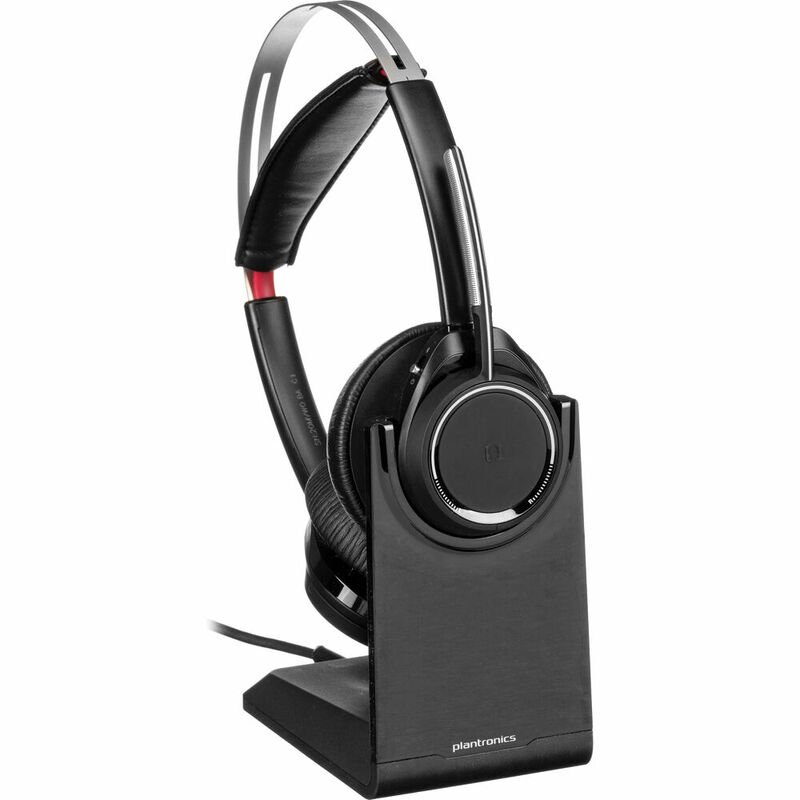 Voyager Focus UC is supported by Plantronics Manager Pro, a software utility that is sold separately. Use Plantronics Manager Pro to manage headset inventory, monitor usage, and maintain devices. With actionable insights from Plantronics Manager Pro, IT can improve business processes, employee performance, and compliance. Box Dimensions (LxWxH) 8.4 x 7.3 x 4.6"
Voyager Focus UC Bluetooth Headset with USB Type-A Adapter for Microsoft UC Applications is rated 4.2 out of 5 by 119. Rated 5 out of 5 by jgscala from The Bentley on Headsets I started using this headset over a month ago and can honestly say it is by far the best headset made. The noise cancelling is flawless, the sound is off the charts clear and the other features will make you one happy customer. Setup is easy and the linking to your computer is as simple as it gets. I use this headset while traveling and in my office with no issues whatsoever. It connects everytime and never misses a beat. I have used this device on Skype calls, watching You Tube videos, watching movies and give it a solid thumbs up !!! You will not go wrong purchasingthis headset !!! Thanks Plantronics for making a first class device !! Rated 4 out of 5 by cloudguy from Great features and nice sound, quite comfortable I love this headset for conference calls, because I don't feel like I'm yelling at the people on the call like I did with a speaker phone. It's very comfortable to wear and the sound quality is wonderful. I use it for listening to music as well as for calls. Also, the controls on the headset are intuitive and effective. I think the software still needs a bit of work, because I've had two occasions when Skype for Business under Windows 10 didn't recognize the headset even after unplugging and plugging in the USB dongle. I had to reboot my computer to make it work again. Rated 5 out of 5 by bdog22 from Fantastic for any use I use this on occasion when I need some silence and really need to focus on the call, or occassionally just with my phone watch Netflix or listening to music. The headset is phenomenal, noise canceling is superb and it works better than any of my other headsets I have. I've used it in my open office environment with great success and can walk around a pretty good distance while maintaining connection, although I do get some looks because of the size of the headset. I even used this mowing my lawn and at a gun shoot to protect my ears and was well pleased with the results there. For the lawn I can keep the music at a normal volume as opposed to other headset where I have to crank them up to still only hear part of the music. Rated 5 out of 5 by MenloMan from LOVE my Voyager Focus 825!! I bought the Voyager Focus a few weeks ago and have just started using it. I was just working at my home office desk listening to music streaming from the web, and my iPhone rang. I tapped the button on the headset to answer, had the conversation, hung up, then looked around for my phone. I finally located the phone upstairs, about 40 feet away! The range is fantastic with my phone, and seems to be even better with my laptop. The features are really intuitive, and the talk time is great. I usually go two full business days between charges. I replaced a corded headset from another manufacturer, and find the Voyager Focus to be much more solidly built and apparently more durable. Rated 5 out of 5 by Peter K from Great for Skype Calls I bought this specifically to take Skype calls, but I really like it for use with my cell phone as well. The sound is rich and full. It's also nice to be able to cut down on background office noise and it is a very comfortable headset. My only criticisms are that my android phone doesn't like to release control to the dongle and vice-versa. Also, the styling is very conservative almost a little dated: I wish they offered that nice white + tan leather color combination that they use on the Backbeat Sense. Rated 1 out of 5 by Jeff S from Unusable - Can't Turn off Verbal Notifications This headset is unusable for any work environment. Software does not support the capabilities to turn off an annoying "Mute On" reminder that is played back to the user every time mute is pressed on or off. The Software supports turning off the "Mute Off" reminder only but not the "Mute On". During a work call where you have to frequently mute / unmute this is borderline unusable as you miss half of the conversation as the verbal notification is so loud. Called support, they were unable to assist and provided not work around.